With a cameo from Sunny and Bo! Remember last week when Michelle Obama told Jimmy Fallon that she wanted people to show her how “they’re moving“? It was during her appearance on The Tonight Show where she talked up the fourth anniversary of her anti-obesity “Let’s Move” campaign and asked everyone to take to social media with the hashtag #letsmove. If she got enough of a response she suggested that the President and Veep might show us how they get active. Well looks like that ask worked! 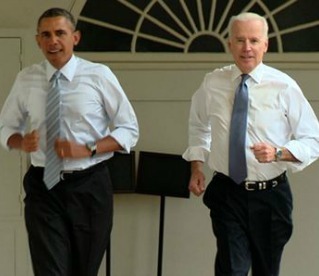 We have footage of both Obama and Biden getting in a workout. A couple of things that might strike you about this clip. First: The President has a very clean desk. Yes, they could have cleaned it off before they shot the video. But seriously, I’m not the President and I have enough stuff on my desk to fill a U-haul. Plants, papers, a raspberry beret (for real), a Tide stain eraser pen. It’s a mess. Kudos for cleanliness Mr. President. Second: They run in dress shoes. When you’re leading a nation, you don’t have time to change outfits. You get up, go for a jog and get back to work. Like a boss. Separately, FLOTUS has been doing a great job of getting the word out about “Let’s Move” these past days in conjunction with the anniversary. The commitment that she’s showing to this cause and related causes, like talking up the proposal from the FDA for new nutrition labels, sends a big message.